National Football League Cheerleading, or simply NFL Cheerleading, is a professional cheerleading organization in the United States. 26 of the 32 NFL teams include a cheerleading squad in their franchise. Cheerleaders are a popular attraction that can give a team more coverage/airtime, popular local support, and increased media image. In 1954, the Baltimore Colts became the first NFL team to have cheerleaders. They were part of the Baltimore Colts Marching Band. Most NFL cheerleading squads are a part-time job. Often, cheerleaders have completed or are attending a university, and continue on to other careers after cheering for one to four seasons. The members participate in practice, training camp, games, appearances, photo shoots, and charity events. Apart from their main duties of cheering during the football games, the cheerleaders have many other responsibilities. Nearly every team member is available for appearances at schools, events, conferences, etc., for a set fee. An anticipated annual event is the release of each squad's calendar, featuring members for each month in swimsuits or uniforms. As well as being a mainstay of American football culture, the cheerleaders are one of the biggest entertainment groups to regularly perform for the United States Armed Forces overseas with performances and tours being enlisted by the USO. Teams send their variety show, an elite group of their best members, to perform combination shows of dance, music, baton twirling, acrobatics, gymnastics, and more. In February 2007, the Buffalo Bills even sent a squad of eight along with their choreographer into the war zone of Iraq. In 1996, the San Francisco 49ers Cheerleaders and their director helicoptered into the war inflicted country of Bosnia with the USO and the U.S. Army. The U.S. troops in Korea have been entertained during the holiday season with the USO's Bob Hope Tour. Over the years, the tour has featured NFL cheerleaders from the Dallas Cowboys and the San Francisco 49ers. In 2018, the first male dancers were added to National Football League Cheerleading. The first "Battle of the NFL Cheerleaders" was held in 1979 in Hollywood, Florida. Two cheerleaders from each cheerleading team compete against other mini-teams in various athletic events. The events include kayaking, 100 yard dash, obstacle courses, and other events. The Minnesota Vikings Cheerleaders took home the title in 1979. In 1980, it was held in Atlantic City, New Jersey and the Washington Redskinettes were the champions. The winners were Shiona Baum and Jeannie Fritz, and each received a car as the grand prize. The competition was resurrected in 2006 by the NFL Network, and was called NFL Cheerleader Playoffs. The playoffs were taped between July 17 and July 21, 2006 at Six Flags New England in Agawam, Massachusetts. Two-person teams of cheerleaders from 25 of the NFL's 32 teams participated in a four-event series of competitions. The first two events tested the cheerleaders' athletic abilities in events like the 100-yard dash, kayaking, tandem cycling, and the obstacle course. The third event was a trivia challenge called "Know Your NFL." The final competition was a one-minute dance routine, similar to what they normally perform on NFL sidelines. The San Diego Chargers team (Casie and Shantel) defeated the Atlanta Falcons and St. Louis Rams squads to win the overall championship. The 3 teams finished in a three-way tie, with 210 points. The Chargers were declared the winners based on winning the dance competition. Listed by name, with corresponding NFL football team. As of 2019, six teams do not have cheerleading squads: Buffalo Bills, Chicago Bears, Cleveland Browns, Green Bay Packers, New York Giants, and the Pittsburgh Steelers. 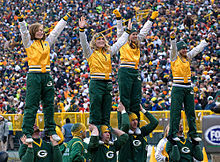 The Packers do, however, use a collegiate squad to cheer at home games. Super Bowl XLV between the Steelers and the Packers in February 2011 was the first time a Super Bowl featured no cheerleaders. The Browns and the Giants are the only NFL teams that have never had cheerleaders, while the other aforementioned teams have had cheer squads in the past. However, there are reports that the Browns did have cheerleaders in 1971, but no records exist. The Buffalo Bills endorsed the officially independent Buffalo Jills from 1966 to 2013; when several cheerleaders sued both the Bills and the Bills organizations, the Jills suspended operations. Teams of "unofficial" cheerleaders began emerging in 2010 for NFL teams that don't have their own dance squad. These unofficial cheerleaders aren't sanctioned by the NFL or any franchise in the NFL and therefore are not allowed to perform at games, represent the football team at any outside functions, or use any of the team's branding or trademarked colors on their uniforms. The teams are sponsored by local businesses, and the cheerleaders perform prior to the game, at tailgate parties, and other local events. Some also attend the local NFL games in uniform, and sit together in their block of season ticket seats. Their audition process, costuming, and choreography are very similar to official NFL cheer teams. Some also produce an annual swimsuit calendar, just like the legitimate cheerleaders. All of the independent teams hope at some point to be embraced by the NFL as "official" cheerleaders of their local teams. The Detroit Pride Cheerleaders were the first independent professional team, put together in August 2010 to support the Lions. However, as the squad was not officially recognized by the Lions, it could not use the Lions' logos nor colors. In 2016, the Lions started an official cheerleading squad. The Gotham City Cheerleaders were organized in August 2011 to support all New York sports, but are most closely associated with the Giants. The team has also been known as the New York Unofficials, the Unofficial Dancers of the New York Giants, and the Gotham’s Team Blue Army Dancers. The Cleveland Spirit Cheerleaders were created in September 2012 to support the Browns as a test team to attract fan interest. This cheer team was created by the same people responsible for the Detroit Pride. There have been criticisms that NFL cheerleading is sexist, exploitative, and outdated. In addition, several cheerleaders have sued their respective teams for violating minimum wage laws, mistreatment from management, and exploitative rules and behaviors. However defenders and proponents of NFL Cheerleading have stated that cheerleading helps young women engage with the NFL at the highest level, provide the NFL with role models for its female fans, and are a cost-effective way of promoting a team at events. NFL spokesperson David Tossell in 2013 defended NFL cheerleading by stating, "Cheerleading has a long tradition in the majority of American sports at both professional and amateur levels; Cheerleaders are part of American football culture from youth leagues to the NFL and are part of the game day experience for our fans." A top honor for an NFL Cheerleader is to be selected as a Pro Bowl Cheerleader. The group is composed of an all-star cheerleader (one from each NFL cheer team) that represents her NFL team at the Pro Bowl in Hawaii. The Pro Bowl Cheerleaders were founded in 1992 and directed by Jay Howarth and Angela King-Twitero. Each year, one squad member from every NFL team is chosen to participate in the collective Pro Bowl cheerleading squad. They are picked by either their own squads or by the fans via Internet polling. Wikimedia Commons has media related to National Football League cheerleaders. ^ "Chicago Honey Bears.net". Chicago Honey Bears.net. Retrieved 2014-03-31. ^ "Detroit Lions to add cheerleaders". Official Site of the Detroit Lions. Detroit Lions, Ltd. Retrieved 13 June 2016. ^ Miami Dolphins Cheerleaders History (2010) Retrieved February 10, 2010. ^ Steelerettes History (2007) Retrieved February 8, 2007. ^ Gold Rush History (2007) Retrieved February 8, 2007. ^ www.buccaneers.com Retrieved February 15, 2007. ^ Cheerleader History Archived 2015-09-24 at the Wayback Machine Retrieved May 20, 2015. ^ Plaschke, Bill (2011-01-27). "No Super Bowl cheerleaders? He says rah!". Los Angeles Times. Retrieved 2011-02-06. ^ "Remember when ... the Cleveland Browns had cheerleaders? Really, they did!". cleveland.com. Retrieved 2018-04-28. ^ Pumerantz, Zack (2011-10-09). "Detroit Lions Cheerleaders: The Hottest Pics of the Detroit Pride". Bleacher Report. Retrieved 2012-11-11. ^ a b "Top 6 NFL Teams Without Cheerleaders". Yahoo! Sports. Archived from the original on 2013-11-30. Retrieved 2013-11-27. ^ Benton, Dan (2012-09-24). "Meet the Gotham City Cheerleaders, Unofficial Dancers for All New York Sports". Giants 101. Archived from the original on 2015-09-11. Retrieved 2012-11-11. ^ Bonchak, Jean (2012-09-27). "Cleveland Spirit cheerleaders coming to Browns Town". The News-Herald. Retrieved 2012-11-11. ^ "Pro Bowl Cheerleaders". National Football League. Retrieved 2013-01-19.